There are many stories floating around the Internet about the true beginnings of the phrase and accompanying doodle, but Wikipedia cites the results of an American Transit Association national radio contest that found the REAL Kilroy. They credit James J. Kilroy as the only person who could prove himself as the originator of the mark, which he may have used as part of his job as an American shipyard inspector. Read more at Truth or Fiction and Snopes for variations on the story of James Kilroy as a welding inspector. 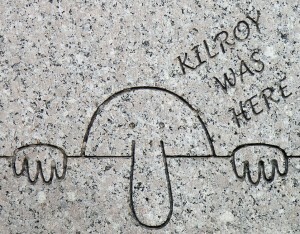 Whatever the origin of “Kilroy Was Here,” the graffiti of a mostly bald guy with a big nose and fingers peeking over a wall became a symbol of American G.I. presence throughout Europe and the South Pacific in the 1940s. 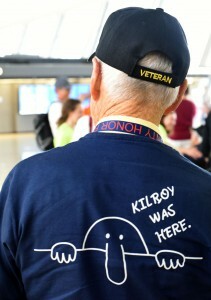 Although Kilroy’s popularity may have peaked in the 1950s, he’s still seen to this day whenever the slogan and cartoon is scrawled by soldiers in places as far away as Iraq and Afghanistan, while other folks continue to take it as a personal challenge to draw the logo in the most unusual places. 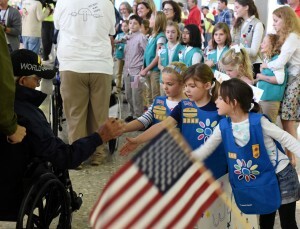 This weekend I was reminded of Kilroy as we brought our daughters’ Girl Scout troop to their first Honor Flight to honor War Era Veterans. 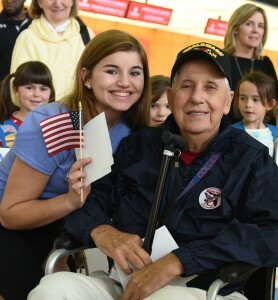 Approximately ninety-four Vets flew from Fort Myers to Dulles International Airport to make their journey to the memorials in Washington, DC. The majority of the participants were senior veterans – World War II survivors, along with veterans of other wars – who came to DC to reflect and gain a sense of closure. 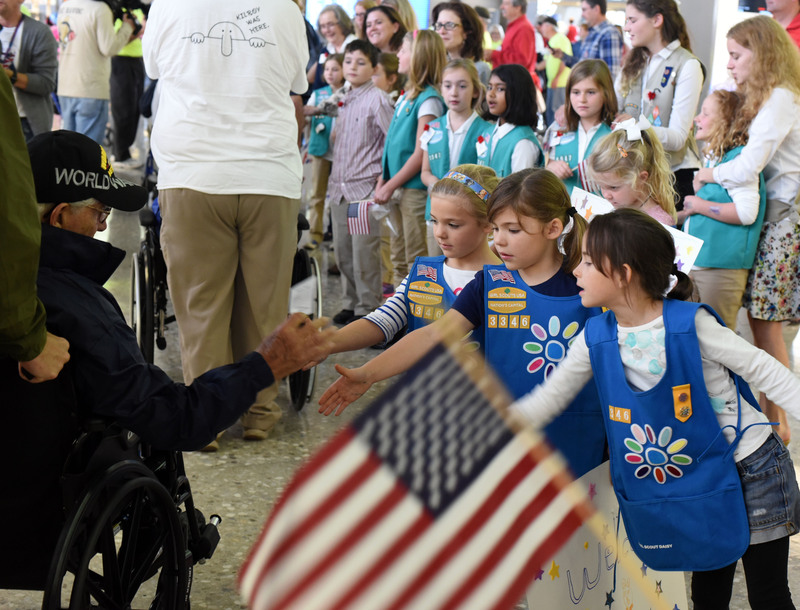 It was very emotional to see these service men and women moved to tears as the Girl Scout Daisies showed their appreciation by handing them gifts and singing Patriotic songs. As one of the moving companies Washington DC knows and trusts, My Guys is honored to be associated with such a great icon of American history.